Mark Lynch: The City of Worcester had two rope tow areas they operated in the 60's. One was located at Green Hill Park within the Golf Course and the other was located at Hadwen Park. Both locations were free and quite crowded. Today they are used primarily for sledding. Chris Kulesza: There was also a rope tow at Green Hill Park in Worcester. The years of operation are unknown. 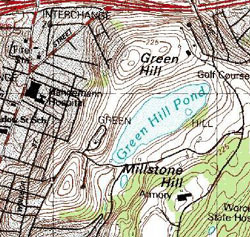 A topo map of Green Hill Park. Anybody else remember this area? If so, let us know.